♥With this mason jar lights, you could make full use of your mason jar to DIY the beautiful garden decor, deck decor, patio decor etc. If you hang it on the tree, when you have a garden party or wedding night, this light will definitely create beautiful ambient out of your expected. 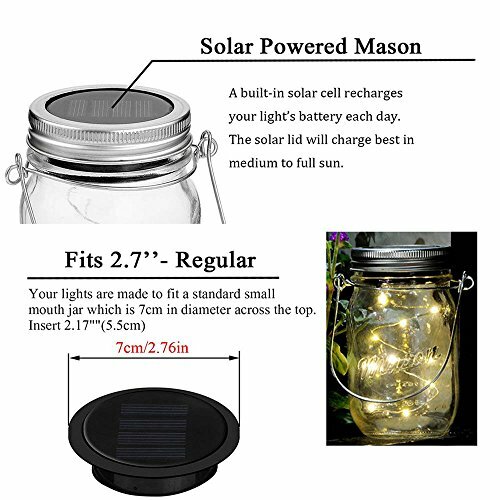 ♥Your solar mason jar lid insert fits into most standard glass mason jars. Simply open the jar and place the LED solar light into the mason jar ring, and close the lid - instant mason jar light! Each light has a built in light sensor so that it automatically turns on in the evenings as the light dims. Each light also includes and On/Off switch underneath the lid. Charging Time: full recharge need 6 hours. 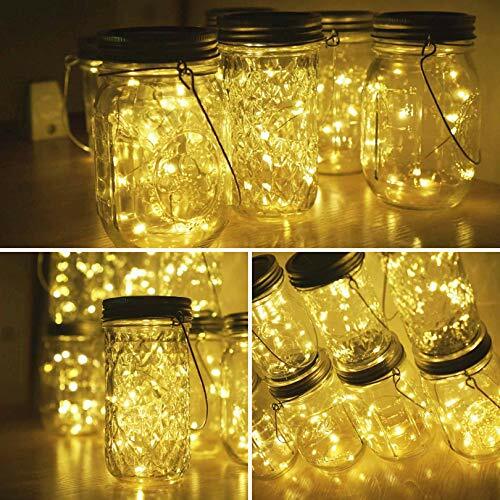 【Beautiful & ROMANTIC Lights】Very popular Mason Jar String fairy firefly Lights Lid. 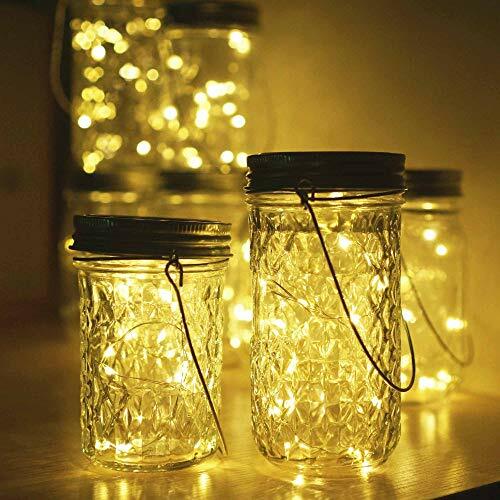 Let your discarded mason jars become a beautiful lights,makes your surroundings romantic and fairy. Best idea for decorations around your apartment. Great for outdoor garden patio deck wedding Christmas parties. A great gift to children,lovers,family and friends. 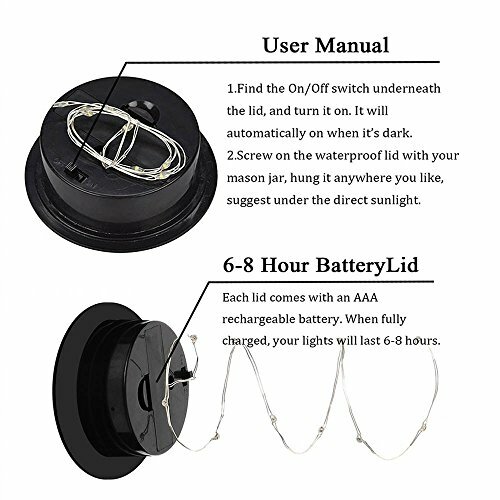 【Solar Powered Mason Jar String Lights Lid】Energy Saving & Environment Friendly. 100% solar powered solar panel, no requires external wiring. Lid Diameter Size: 2.76 inch(70mm)/Insert 2.36 inch(60mm).Magnificent 3.3ft long copper wire with 10 bright old-fashioned warm white bulbs, bright for Garden and House decoration. 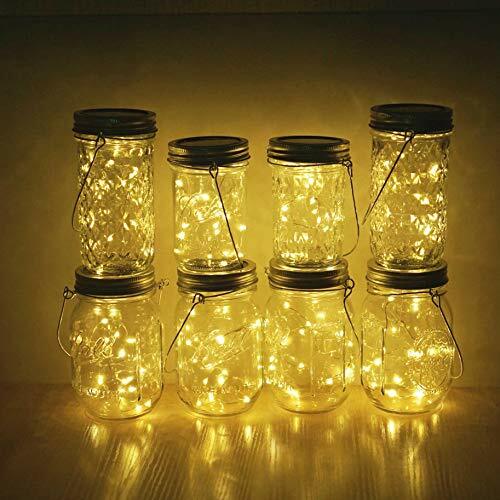 【Energy Saving and Environmental Protection】Recycle Discarded Mason Jars. Generally charge in the sun 6-8h will light up 8-12h.Long lasting LED bulbs,little heat,safe to handle even after long-time use. 【Convenient Safe Solar/Easy to Use】Automatically Turn ON/OFF Smart Light Sensor. Lights will turn ON when the dark,and turn OFF when the daytime. Each light includes an On/Off switch under the lid, turn it on before charging by solar. 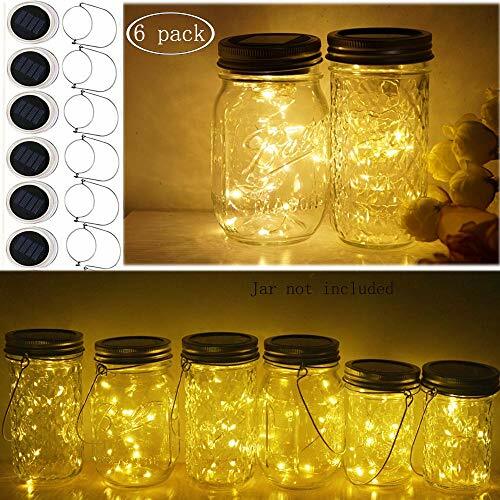 【Pack of 6 Lids/Hangers Kit & Brand Guarantee】- What you get - Pack of 6 units of Miaro Mason Jar LED String Lights Lid and Hangers. Any problem can contact us first for free, we will give you a prefect solution and provide you the best customer service. If you have any questions about this product by Miaro, contact us by completing and submitting the form below. If you are looking for a specif part number, please include it with your message.